The debate on why humans should or should not return to the Moon has been ongoing for years. Two weeks ago, I had the opportunity to hear astronaut Ron Garan speak eloquently on a subject he is passionate about, water sustainability on planet Earth. Subsequently, I read an essay Garan wrote about the importance of returning to the Moon. Although Garan originally wrote this essay before the cancellation of the Constellation program was announced, he has amended his thoughts to reflect the likelihood that the US won’t be returning to the Moon anytime soon. With Garan’s permission, we are re-publishing his essay in its entirety. On May 10th, 1869, a golden spike joined two railways at Promontory Point, Utah, and the first transcontinental railroad was completed. On January 14th, 2004, a new vision for our Nation’s space exploration program was announced that committed the United States to a long-term human program to explore the solar system starting with a return to the moon. On February 1st 2010, those plans to return to the moon were put on hold. Although our Nation has decided to postpone a return to the moon it is still important to acknowledge the moon’s relevance to life on Earth. There is no doubt that the railroad changed the world. It opened up frontiers to discovery, settlement, and commerce. The railroad was the backbone for the industrial revolution that provided the largest increase in life expectancy and improvement in quality of life in history. Just as the industrial revolution brought about unprecedented improvements in quality of life so can a new age of space exploration and development, but this time with a positive impact on the environment. To begin a period of sustainable space exploration, both the public and private sectors of our Nation must seize the opportunity and continue on a path to the moon. Since the Vision for Space Exploration was announced in 2004, there has been an on-going debate about the importance of taking the next step in space exploration, a return to the moon. The reasons for making this the next step include: fulfilling a compelling human need to explore; gaining a foothold on the moon to prepare for journeys to other worlds; easing the world’s energy problems; protecting the planet from disasters; creating moon-based commercial enterprises that will improve life on Earth, conducting scientific research; inspiring young people toward higher education, and utilizing space resources to help spread prosperity throughout the world. We should not return to the moon for any one of these reasons, but for all of them and more. By first establishing the basic infrastructure for a transportation system between the Earth and the moon and a sustainable, semi-autonomous, permanent human settlement, we will open the door to significant benefits for all. Of course, any permanent lunar base must be economically and politically sustainable and therefore must provide tangible benefits and a return on investment. Establishing a lunar infrastructure will challenge us to improve the reliability of space transportation and allow us to demonstrate exploration systems and concepts without leaving the relative safety of near-Earth space. Testing systems and concepts at a location that’s a three-day journey from Earth is a logical step before we make the leap of a six-month journey to Mars. Establishing a permanently occupied lunar base also will open the way to detailed study and use of lunar resources, which likely are significantly more economical than lifting all required exploration resources from the Earth’s surface. Energy: Today, about 1.6 billion people on the Earth don’t have access to electricity. The World Bank estimates that 1.1 billion people live in extreme poverty which leads to 8 million premature deaths every year. In developed countries, higher quality of life is achieved only through a high rate of energy use. Increased energy supply is needed for economic and social development, improved quality of life, and to grow enough food to provide for the citizens of the developing world. Unless something is done soon, the world will be faced with a crisis of enormous proportions. The United Nations estimates that world population will be approximately 9.1 billion by 2050 with virtually all growth in the 50 poorest countries. The choices that the global society makes to provide for future energy needs will have a profound effect on humanity and the environment. The moon can supplement Earth-based renewable energy systems to meet future energy demand. Ample energy from the Sun reaches the moon and is not interrupted by weather, pollution or volcanic ash. Solar energy farms on the moon can “beam” limitless clean energy down to where it is needed on Earth or to satellites for relay to the Earth. There are also other potential sources of energy including platinum for fuel cells and an isotope called helium-3, which could be used in fusion reactors of the future. Supplying energy from the moon will enable us to help provide the Earth’s energy needs without destroying our environment. Protect the Planet from Disasters: There is a real risk to the Earth’s inhabitants from asteroid impacts and super-volcano eruptions. If a large object the size of Comet Shoemaker-Levy 9 that recently slammed into Jupiter were to hit the Earth, civilization could be destroyed. Much smaller asteroids could cause tremendous damage and loss of life. The moon is a superb location for early detection systems. A super-volcano eruption is a geologic event of enormous explosive power to affect the global climate for years. Scientists estimate the last such eruption happened 74,000 years ago, and was 10,000 times more powerful than Mount St. Helens. Tremendous amounts of rock and ash were ejected into the air causing a six year long volcanic winter and a 1,000-year instant Ice Age, massive deforestation, disastrous famine, and near extinction of humankind. Scientists estimate that such a super-eruption will occur about once every 100,000 years. The systems and technology that will be developed for life and work on the moon can be used to develop habitats and systems that could preserve Earth’s inhabitants in the event of a devastating eruption. These systems will also improve our ability to live in extreme environments and can be used to learn how to overcome limited resources and other environmental issues. Moon-Based Commercial Enterprises: When the early pioneers headed west and expanded our Nation, they did not carry everything with them that they would need for their journey. They “lived off the land” and we will also need to use those resources available to us along our journey, starting with the moon. There are numerous moon-based commercial activities that could significantly offset the cost of a moon base. Just a few of these are lunar refueling or servicing stations for satellites, lunar mining and space tourism. These commercial activities would allow us to return national treasures from space and provide a significant return on our space investment. Scientific research: The moon offers an incredible opportunity to further human understanding and discovery. Since the moon’s ancient surface is relatively undisturbed, study of its geology can help us better understand the geological history of Earth. Further, the moon’s vacuum environment can’t be duplicated on the Earth or in low-Earth orbit, and could lead to new materials, advanced alloys, medicines and innovative ways to deal with limited resources on Earth. Radio telescopes on the far side of the moon would be shielded from all radio signals (noise pollution) from Earth, allowing tremendous sensitivity increases and telescopes pointed at the Earth could identify and predict weather and climate changes. If we return to the moon just for science and exploration then activities will be limited by the amount of money our nation is willing to devote. But, if we establish a sustainable, economically viable lunar base then our science and exploration will be limited only by our imagination. Education: Our children are our best investment for the future, and our space program is a tremendous motivator. Our Nation has seen a steady decline in the number of students studying math and science. The space program can help turn this trend around. I can personally attest to the ability of the space program to encourage students based on the fact that I enrolled in math and science courses and began the pursuit of an engineering degree the day after the first space shuttle mission landed. The creation of a permanent lunar base will inspire millions of young people toward higher education and help maintain our Nation’s technological leadership. Resources and Other Benefits: Since we live in a world of finite resources and the global population continues to grow, at some point the human race must utilize resources from space in order to survive. We are already constrained by our limited resources, and the decisions we make today will have a profound affect on the future of humanity. Using resources and energy from space will enable continued growth and the spread of prosperity to the developing world without destroying our planet. Our minimal investment in space exploration (less than 1 percent of the U.S. budget) reaps tremendous intangible benefits in almost every aspect of society, from technology development to high-tech jobs. When we reach the point of sustainable space operations we will be able to transform the world from a place where nations quarrel over scarce resources to one where the basic needs of all people are met and we unite in the common adventure of exploration. The first step is a sustainable permanent human lunar settlement. How should we go about this important undertaking? A good analogy to look at is the U.S. railroad system. The greatest obstacle for the first railroad developers was financial risk. Purchasing right of way, paying wages for large workforces and buying materials and equipment were prohibitively expensive. But the federal government stepped in, orchestrating massive land grants and other incentives. Once initial government investment was assured, enterprising developers invested enormous sums to bridge vast valleys and tunnel through enormous mountains. Today we are faced with similar obstacles in the development and use of space for the benefit of humanity. Potential space developers face enormous up-front costs for high-risk, long-term returns on investment. To capitalize on the tremendous moon-based opportunities, our nation should establish the basic infrastructure for a transportation system between the Earth and the moon and a sustainable human settlement on the moon. Once this initial investment is made, commercial revenue-generating activities can be established. Just as our investment in the railroad, interstate road system, hydro-electric dams and other large federal projects have been paid back many times over by increased productivity and quality of life, so will our investment in lunar infrastructure. We are poised on the doorstep of an incredible opportunity to benefit all of humanity. We have the technology and the ability to make this a reality — we need only the will to see it through. We need to choose a course toward the utilization of space to increase our available resources, global prosperity, quality of life, technological advancement, and environmental stewardship. Just as we look back and thank those before us for developing things most of us take for granted such as railroads and highways, the generations to come should be able to look back and thank us for committing to sustainable space exploration. We’ve lost the Moon. But have we gained the solar system while boosting commercial space ventures? “The President’s Budget cancels Constellation and replaces it with a bold new approach that invests in the building blocks of a more capable approach to space exploration,” states the Office of Management and Budget’s Fact Sheet on NASA’s 2011 budget. NASA will get additional $6 billion over the next five years tacked on to the current budget of just under $18 billion. The budget information released so far does not provide for a specific destination for humans in space. So, while some see this new direction as a course correction; others see it as an endgame. With an extension to the International Space Station to 2020, humans may well be stuck in low Earth orbit for at least another decade. But in this proposed budget, which must be approved by Congress, NASA will provide funds for commercial space companies to build vehicles to ferry astronauts to and from the ISS. With the space shuttle program ending this year, NASA had agreed to pay Russia $50 million a seat. Commercial space companies could likely provide the seats for less money, but their vehicles are not yet human rated or tested. It is true that the Constellation program was “over budget, behind schedule, and lacking in innovation due to a failure to invest in critical new technologies.” But $9 billion has already been spent on developing the Ares rockets and the Orion crew capsule, and $2.5 billion is in the budget proposal to close out Constellation. Proponents of Obama’s budget proposal say moving towards using private commercial space companies will create more jobs per dollar because the government’s investment would be leveraged by millions of dollars in private investments. NASA already has contracts with SpaceX and Orbital Sciences Corp. to bring cargo to the station, and . SpaceX is also developing vehicles to bring astronauts to orbit and back. Already, some say they will fight this budget. “I, for one, intend to stand up and fight for NASA, and for the thousands of people who stand to lose their jobs,” said Senator Bill Nelson last week, as rumors were flying and details about the budget were leaking out. With the US facing a federal deficit of $1.26 trillion in 2011, Obama federal budget proposal puts a three-year freeze on most non-defense discretionary spending after 2011, which the president believes will save $250 billion over the next 10 years. So, giving NASA the $6 billion over the next five year is a way to circumvent that freeze for NASA. $183 million to extend operations of the ISS past its previously planned retirement date of 2016. NASA will deploy new research facilities to conduct scientific research and test technologies in space. New capabilities could include a centrifuge to support research into human physiology, inflatable space habitats, and a program to continuously upgrade Space Station capabilities. $600 million to complete the final five shuttle missions, allowing for a safe and orderly retirement of the Space Shuttle program even if its schedule slips into Fiscal Year 2011. $1.2 billion for transformative research in exploration technology that will involve NASA, private industry, and academia, sparking spin-off technologies and potentially entire new industries. $150 million to accelerate the development of new satellites for Earth Science priorities. $170 million to develop and fly a replacement of the Orbiting Carbon Observatory, a mission to identify global carbon sources and sinks that was lost when its launch vehicle failed in 2009. $500 million to contract with industry to provide astronaut transportation to the ISS, reducing the sole reliance on foreign crew transports and catalyzing new businesses and significant new jobs. $3.2 billion for science research grants and dozens of missions and telescopes studying the planets and stars – including new missions such as the successor to the Hubble Space Telescope, missions to study the Moon, and two Mars exploration missions. $14 million ($420 million over five years) for a mission to the Sun, flying through its outer atmosphere to better understand how it is heated and how it ejects the stream of charged particles known as the solar wind. Increase funding to detect asteroids that could potentially pose a hazard to the Earth. Increase annually the percentage of NASA higher education program student participants employed by NASA, aerospace contractors, universities, and other educational institutions. For more details see this pdf from the OMB, or this OMB fact sheet. Depending on whether the Obama administration decides to continue the Ares I program, this decision may be moot. Earlier this week Sen. Bill Nelson said Obama may make a decision on NASA’s future path, based on the report by the Augustine Commission, by the end of November. At a press conference last week Hanley said the team continually assesses their flight test program. This week managers met and decided that the Ares I-Y flight fell too late in the vehicle development phase to provide useful information and lacks key elements to make it a true validation of the flight vehicle’s systems. Originally, the I-Y test was planned for 2012. It was to be a suborbital flight to test a five-segment booster, a flight production upper stage, a functional command module and launch abort system and a simulated encapsulated service module, but without a J-2X engine. By fall 2008, program managers were already looking at changing direction for the Ares I-Y test to improve the overall program’s chances of flying a full test vehicle by 2014. Now, with the Constellation Program nearing its preliminary design review and with maturing vehicles and systems, managers agree the I-Y test objectives can be achieved through other tests already in the manifest. 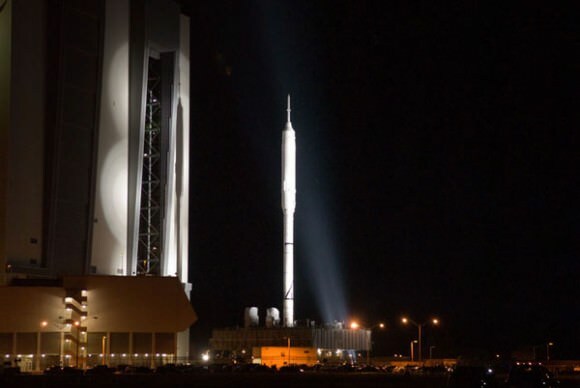 NASA is now studying the costs and benefits of going ahead with a 2012 launch previously called “Ares I-X prime” that would flight-test a full five-segment Ares I solid-fuel first stage and the Orion crew exploration vehicle launch abort system at high altitude. NASA Administrator Charlie Bolden has asked for an evaluation of alternative heavy lift rockets, including DIRECT’s Jupiter launch vehicle. The evaluation is a “top priority,” according to NASASpaceflight.com, and a special team from the Marshall Space Flight Center has been commissioned to conduct the study, with the directive to have a report ready by the end of November. Looking at alternatives to the Constellation program is an apparent reaction to the final Augustine Commission report, which will be made public on Thursday. The other heavy lift vehicle also to be looked at is the Shuttle Derived Heavy Lift Launch Vehicle, which is a shuttle-based concept with a cargo carrier side mounted to the current design of the external tank. The concept is capable of launching 80mt (metric tons) into Low Earth Orbit (LEO) and around 54mt to the moon. However sources at NASASpaceflight.com note that the DIRECT team’s Jupiter launch system has dominated early discussions at the Special Team meetings. For more information on the Direct project, see our previous in-depth article here, or the DirectLauncher website.